Why do so many gamblers risk it all when they know the odds of winning are against them? Why do they believe dice are “hot” in a winning streak? Why do we expect heads on a coin toss after several flips have turned up tails? What’s Luck Got to Do with It? takes a lively and eye-opening look at the mathematics, history, and psychology of gambling to reveal the most widely held misconceptions about luck. It exposes the hazards of feeling lucky, and uses the mathematics of predictable outcomes to show when our chances of winning are actually good. Mathematician Joseph Mazur traces the history of gambling from the earliest known archaeological evidence of dice playing among Neolithic peoples to the first systematic mathematical studies of games of chance during the Renaissance, from government-administered lotteries to the glittering seductions of grand casinos, and on to the global economic crisis brought on by financiers’ trillion-dollar bets. 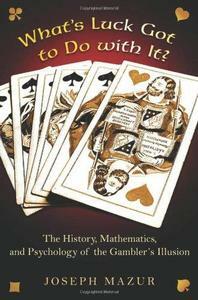 Using plenty of engaging anecdotes, Mazur explains the mathematics behind gambling–including the laws of probability, statistics, betting against expectations, and the law of large numbers–and describes the psychological and emotional factors that entice people to put their faith in winning that ever-elusive jackpot despite its mathematical improbability. As entertaining as it is informative, What’s Luck Got to Do with It? demonstrates the pervasive nature of our belief in luck and the deceptive psychology of winning and losing.